Making rocks is the next thing to do after you’ve developed the terrain and made land formations for your layout. That is, assuming you want or need rock formations for the scenes you are trying to depict. Obviously, if most of your layout is based on city railroading or wheat fields and grain service, you may not need many rocks. 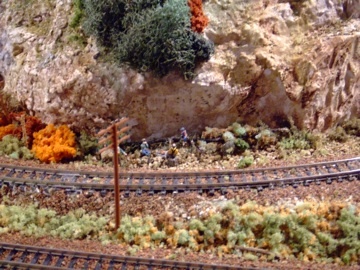 However, I suspect most layouts will contain a few rocky areas. I like rocks and mountains personally even though I live on a flat coastline. 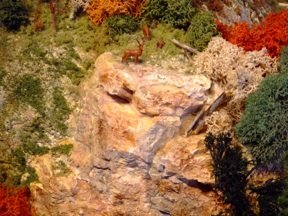 I have always greatly enjoyed visiting rocky and mountainous areas of this country and attempting to recreate them on the layouts that I have built. The following is a guide to help you make realistic artificial rocks with techniques that I have found to be successful (and some that I haven’t done yet, but others have accomplished with great success). This is one method that I have used frequently for making rocks which begins with purchasing commercially available rubber rock molds along with Hydrocal, a light form of plaster (– better than real plaster for making molds because it shows more detail on the final product, and your layout or diorama won’t be so heavy if you have to move it). There are many different sizes and shapes of molds available. You have to choose which ones would be the most appropriate for what you are trying to do. For example, are you creating an outcropping of rocks, a rock wall or cliff, or just adding rock formations to the side of a mountain? You don’t really need to buy a lot of these. The rocks you make with just a few of these molds can be rotated, turned upside down, put together in various combinations in different areas of your layout so that the average observer will not be able to tell that the empire of rocks and mountains you have made came from only 3-4 different rock molds. In addition, when you incorporate each of the rock molds into your layout, you can modify them further by using plaster cloth and/or a molding material called Sculptamold with which you can create your own rock formations in between the rocks you have made with the molds. •	When you’re ready to begin making rocks, you should first prepare the rubber mold by spraying the inside with a very dilute solution of water containing a few drops of dishwashing liquid. This will make it easier to remove the rock after it has hardened in the mold. Make sure there are no bubbles left inside the mold however, since these may show up as unwanted details on the rock surface. •	Then mix the Hydrocal with water according to the directions on the box. You may wish to add just a little more water to make a slightly soupier solution of the Hydrocal, which will make sure that the material gets into all the nooks and crannies of the mold. Don’t make it too thin or the resulting rock will be too brittle. •	Pour the mixture into the “wetted” mold. Then lightly tap the bottom of the mold on a hard surface, which helps any bubbles in the mixture to rise to the top (away from the rock surface). •	Allow the Hydrocal to dry out overnight. You can try to take the mold out earlier after only about an hour if you want the mold to be malleable enough to bend a little for better incorporation into your scene. Frankly, though, I never had much luck doing this because the incompletely dried mold seemed to break too easily. Perhaps, it was because I didn’t time it just right. At any rate, I had better success just letting it dry completely overnight and then use a separate mixture of Hydrocal or Sculptamold to help me incorporate the dried rock into the wall or mountain. The traditional way of doing this is to use a real rock that looks interesting to you and that you would like to use as a mold for making rocks. 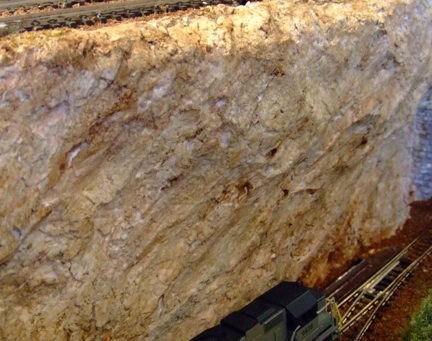 The technique involves brushing multiple layers of liquid rubber latex onto the surface of the real rock with an appropriate drying period between each layer. A layer of cheesecloth should be sandwiched in between every 2-3 layers of latex to add strength. Once you have about 6-7 layers of latex and cheesecloth and after it has completely dried, you can then peel the rubber mold off the surface of the rock being careful not to tear it. Then use the same technique described above for pouring Hydrocal into the “wetted” mold and let dry overnight. One of my own techniques for making rocks that has worked for me is to take a sheet of aluminum foil and wrinkle it up so that there are lots of crevices. Then place the wrinkled sheet on top of dry sand inside a 2-inch deep pan or box. You can shape the sand and foil inside the pan whatever way you want so that the completed mold will be curved or rounded, rectangular or any other shape or size that you wish. Then spray the aluminum foil with your mixture of water containing a few drops of dishwashing liquid so the mold can be easily removed later. Pour the Hydrocal into the mold and let it dry overnight. After the molded plaster is dried, you can further shape it with a small handsaw or coarse sandpaper so that it fits in your space on the layout better. You can also scrape the front surface of the rock with a knife or carving tool or sandpaper to make it look more coarse or textured and to make more indentations and crevices if you need to in order to enhance the realism.Then incorporate the dried mold into your layout as described above. You can purchase sheets of ready made “rocks” at hobby stores that can be cut and shaped however you want in order to fit them into the space where you need them. Sculptamold or plastercloth can then be used to fill in the spaces around the edges to help them blend into the terrain. These make very believable rock walls if blended in well. Another way of making rocks, walls and cliffs that I like to use is to just apply Sculptamold in an irregular fashion using a small trowel and/or your fingers onto the surface of the plastercloth that you used to form your terrain. After you have applied the Sculptamold to the surface you can cut lines and crevices any way you want to try to simulate an irregular rock surface. If you have a sizable layout, you will probably want to use a combination of most or all of these techniques for making rocks. That will make for a more interesting degree of variability in your scenery that will keep your viewers guessing about how you did it all! 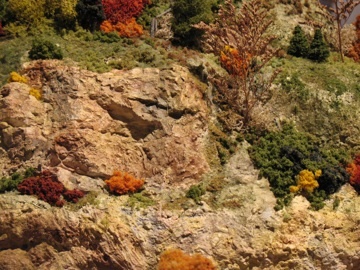 From "Making Rocks" to "Model Train Scenery"
From "Making Rocks" to "Homepage"